Samsung’s Galaxy S9 and Galaxy S9+ are set to be unveiled this coming Sunday, and they’re definitely going to be great new phones. They feature the best cameras and performance Samsung has ever managed in a smartphone, and either one will make a fantastic replacement for your current smartphone… as long as you’re willing to spend $850, $950, or even over $1,000. That’s right, the Galaxy S9 and S9+ are going to be insanely expensive, and lots of people don’t want to blow that kind of cash on a phone. Luckily for them, Samsung just quietly released two new phones in the US that cost way less. Behold the brand new Galaxy A8 and Galaxy A8+, two new phones that offer high-end construction and a premium all-screen design at a mid-range price point. 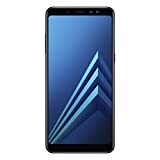 They’re available to purchase right now from a few different retailers including Amazon, which has both the Galaxy A8 and Galaxy A8+ in stock right now with free Prime shipping. Of note, however, neither model includes a warranty if you buy it on Amazon. One retailer is offering the A8 and A8+ with a warranty though, and that’s B&H. Below, you’ll find links to the phones on both sites, so take your pick.